Here’s one last image connected to my recent posts about the buying and selling of my car. These are the keys from my 2007 Toyota Prius, which I sold, when I purchased the 2017 Subaru Impreza. On the left, the key I used daily for 10+ years. On the right, the completely unused one, that I had safely stored away until the night before the sale. I popped in a new battery to make sure it worked. I’m slightly surprised how much wear it sustained, just being in my pocket. The red emergency button fell off. The rubber buttons started separating from the plastic. The housing shows smoothness from years of friction against cotton pockets. To Toyota’s credit, the key kept on working, though a weak and inconsistent signal was a telltale sign of a needed battery change. Of all the high-tech features of my 2007 Prius, I most loved the keyless entry and keyless start. My car previous to the Prius, the 1992 Acura Legend had a truly conventional, old-fashioned key. I had to stick it into the keyhole to open the door and, of course, I needed to insert it into the ignition. Being able to operate a car completely, without removing the key from my pocket, is a true delight. It feels like I’m not using a key at all, and I am somehow immune from the realities of modern urban life, where we need to secure our valuables. I opted for a higher trim level to get this feature on the Subaru. It would be tough to go backwards. 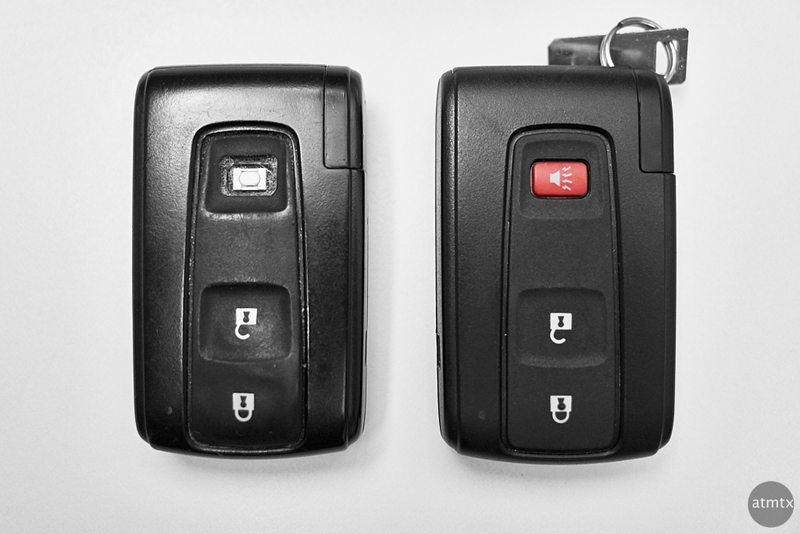 The keyless entry systems are common now, but 10 years ago, it felt a little like magic. I’ve read your car posts with interest as I was in a similar situation only a few weeks ago. However, my story seems rather boring in comparison. My daughter recently got her driver’s licence and after a couple of weeks of sharing two cars between three, my wife decided that just wasn’t going to work (public transport in our neck of the woods is rather limited). Anyway, to cut a brief story shorter still, two hours after she’d made her decision we’d bought a new car. Unlike you, I’ve a real aversion to doing research and making choices when it comes to shopping for anything so this quick purchase was just perfect for me. And as for remotes, I have one for my car but never use it. Not sure why but I always stick the key in the door to lock or unlock it. I guess it’s all horses for courses as they say. Anyway, enjoy your new car. I think the colour is real nice. As I know next to nothing about cars that’s the only comment I can safely make :). I like your story and thanks for the comment. It shows how different people can be. What kind of car did your wife get?